Just outside the Italian town of Sermoneta there is a romantic garden called Ninfa, known in every part of the world. Ninfa was the name of an ancient town owned by the Caetani family, and this is its first peculiarity. It was not simply a private estate, it was a town, with its own houses, churches, its shops and even a castle. Its second distinctive trait regards the subject of ruins. In landscape gardens, false ruins are often used as focal points. Ninfa's ruins are real. What we see today was once a real town, destroyed during a war in 1380 in which two branches of the Caetani family were involved. 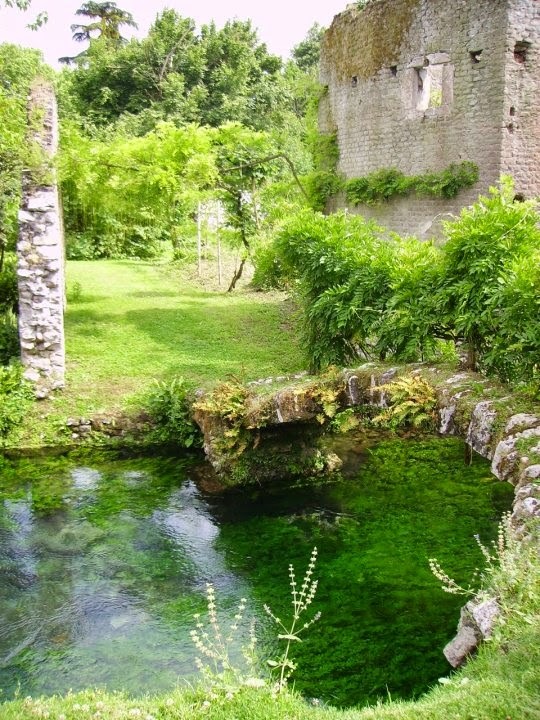 The first garden in Ninfa was created in the Sixteenth Century by Cardinal Nicolò Caetani. It was a walled garden organized by two orthogonal axes with an octagonal basin at their intersection. Far from what it would later become, the first garden of ninfa was a kind of hortus conclusus. We can see clear traces of it today, and the octagonal basin is still there. Ninfa remained abandoned for centuries, but it began to receive increasing interest by travelers during the Nineteenth Century. What they saw was, entirely accidentally, surprisingly similar to a landscape garden, because Nature had taken over the buildings. Ninfa had become, unconsciously, a landscape garden. Only at the beginning of the Twentieth Century did Gelasio Caetani decide to transform his hometown into a real garden, and his heirs continued to improve it throughout the duration of the whole century. He restored part of the ruins and added only one new building, a small cabin similar to the ones stonecutters and charcoal-burners used to live in. This is the only intentional fabrique in Ninfa. Over the last 100 years women of the Caetani family took care of the garden, planting roses and trees and giving it its final shape. No expert gardeners ever worked on it. Marguerite Caetani’s interests were not limited to gardening. She brought to Ninfa art and culture. She was indeed a journalist and an art collector and she founded the literary magazines Commerce (in France) and Botteghe Oscure. The director of the last magazine was Giorgio Bassani, who spent much of his time in Ninfa where he wrote his most famous novel, Il giardino dei Finzi Contini, during one of his stays. 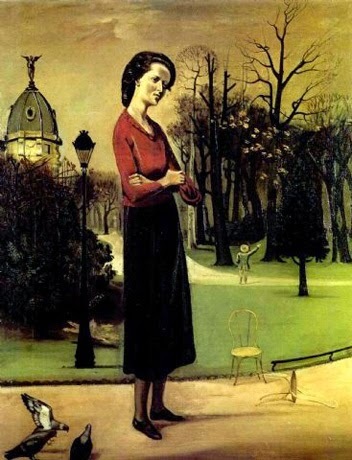 Balthus, portrait of Lelia Caetani. Marguerite's daughter, Lelia, continued her mother's improvements to the garden and left us paintings of Ninfa. She was a member of the Royal Horticultural Society, she visited English gardens quite often and married an English man, Hubert Howard, who founded Italia Nostra, an association for the defense of the historical, cultural and environmental heritage of Italy. 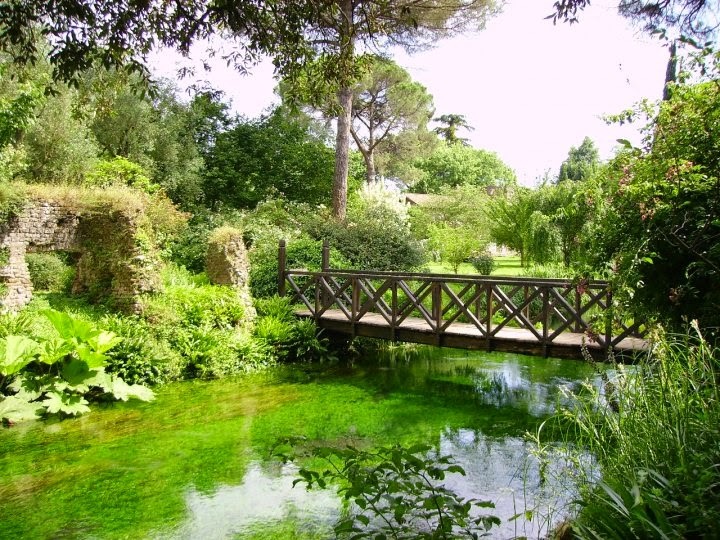 Today the garden of Ninfa is open to the public and preserved by a foundation. Caracciolo, Marella e Pietromarchi, Giuppi. Il giardino di Ninfa. Torino: Allemandi, 1995. Conforti Calcagni, Annamaria. Una grande casa, cui sia di tetto il cielo. Il giardino nell'Italia del Novecento. Milano: Il Saggiatore, 2011. Fiorani, Luigi. Ninfa. Una città, un giardino. Roma: L'erma, 1990. Quest-Riston, Charles. Ninfa. The most romantic garden in the world. London, 2009. Randall, Frederika. Day Trip; a secret garden. In: The New York Times, June 16 2002.